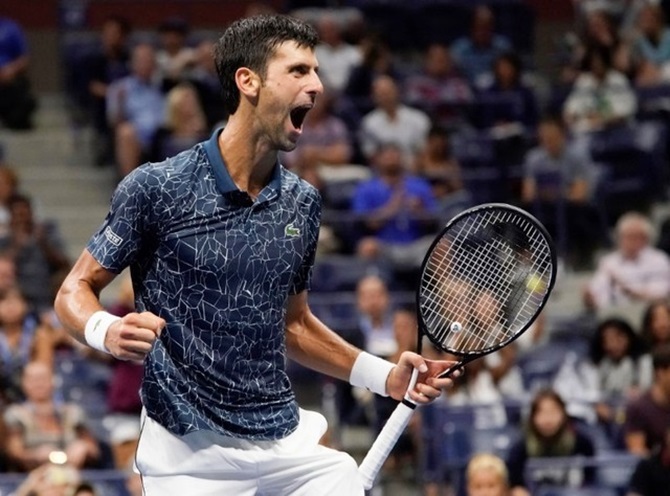 Novak Djokovic sat out last year's US Open to rest an elbow injury that eventually required surgery, but that pain and frustration felt like a distant memory on Friday when the Serb completed his march to the New York final with authority. Djokovic barely played in the second half of 2017 as his ailing body demanded a lengthy hiatus and the rejuvenated Serb now appears hungrier than ever, intent on making up for lost time by claiming a second Grand Slam title of the year. "There was always part of me that believed I could come back relatively quickly to the level of tennis that I once was playing," sixth seed Djokovic told reporters after he completed a 6-3, 6-4, 6-2 semi-final demolition of Japan's Kei Nishikori. "But at the same time, I felt like the six months off served me very well to find new motivation, inspiration, to recharge my batteries." Djokovic roared back into the spotlight when he ended a 54-week title drought in style by securing a fourth Wimbledon championship and 13th career Grand Slam crown with a performance that suggested he has plenty of majors left in him. 31-year-old Serb, clearly enjoying the fruits of his labour, delivered a comprehensive performance against Nishikori as he served impeccably, was solid with his returns and dominated from the back of the court. Next up is a mouth-watering clash against Argentine third seed Juan Martin del Potro and should Djokovic bag a third New York crown, he would join 14-times Grand Slam winner Pete Sampras in third on the all-time list, trailing only Roger Federer (20) and Rafael Nadal (17). Few would have predicted such a remarkable season for Djokovic, who lost in the fourth round of the Australian Open, underwent surgery on his right elbow and fell at the first hurdle in Indian Wells and Miami on his return. But Djokovic, who looked on from the sidelines while Federer and Nadal padded their Grand Slam totals, now stands one victory away from winning Wimbledon and the U.S. Open in the same year for the third time in his career. "These are pinnacles of our sport: majors. It's where you want to play your best," Djokovic added. "There is something special about them. "Especially the top players, they always try to set their own form, so to say, around the Grand Slams because that's where they want to play their best."